10 Christmas Light Tips to Save Time, Money and (Possibly) Your Life! Shop the after-Christmas sales to stock up on lights for next year at a lower price. Christmas lights can be modest displays to show good cheer, or million-bulb light-apaloozas that draw gawkers from near and far. Here are some tips on how to get the most from — and spend the least on — your holiday display. 1. Safety first. Emergency rooms are filled with home owners who lose fights with their holiday lights and fall off ladders or suffer electric shocks. To avoid the holiday black and blues, never hang lights solo; instead, work with a partner who holds the ladder. Also, avoid climbing on roofs after rain or snow. 2. Unpack carefully. Lights break and glass cuts. So unpack your lights gingerly, looking for and replacing broken bulbs along the way. 3. Extension cords are your friends. Splurge on heavy-duty extension cords that are UL-listed for outdoor use. 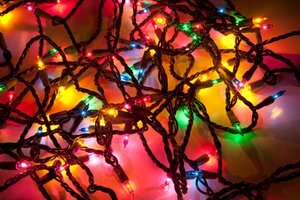 To avoid overloading, only link five strings of lights together before plugging into an extension cord. 4. LEDs cost less to light.LED Christmas lights use roughly 70% to 90% less energy and last up to 10 times longer than incandescent bulbs. You can safely connect many more LED light strings than incandescents. Downside: Some think they don’t burn as brightly as incandescent bulbs. 5. Solar lights cost nothing to run.Solar Christmas lights are roughly four times more expensive to buy than LEDs, but they cost zero to run. They’re a bright-burning, green alternative. Downside: If there’s no sun during the day, there’s no light at night. The jury’s also still out on how long they last; they’re too new on the market for results. 6. Dismantle lights sooner than later. Sun, wind, rain, and snow all take their toll on Christmas lights. To extend the life of lights, take them down immediately after the holidays. The longer you leave the up, the sooner you’ll have to replace them. 7. Plan next year’s display on Dec. 26. Shop the after-Christmas sales to get the best prices on lights and blowups that you can proudly display next year. Stock up on your favorite lights so you’ll have spares when you need them (and after they’re discontinued). 8. Permanent attachments save time. If you know you’ll always hang lights from eaves, install permanent light clips ($13 for 75 clips) that will save you hanging time each year. You’ll get a couple/three years out of the clips before sun eats the plastic. 9. Find those blueprints. Instead of guessing how many light strings you’ll need, or measuring with a tape, dig up your house blueprints or house location drawings (probably with your closing papers) and use those measurements as a guide. 10. Store them in a ball. It sounds counterintuitive, but the best way to store lights is to ball them up. Wrap five times in one direction, then turn the ball 90 degrees and repeat. Store your light balls in cardboard boxes, rather than in plastic bags: Cardboard absorbs residual moisture and extends the life of your lights. Lisa Kaplan Gordon is a HouseLogic contributor and builder of luxury homes in McLean, Va. She’s been a Homes editor for Gannett News Service and has reviewed home improvement products for AOL.